The contents of the workspace should be placed in folders. A well-organised workspace is easy to manage and you can find things quickly when they are organised in folders. A folder may also have subfolders but you should not make your folders too ‘deep’. It can make finding things difficult and complicate navigation in the workspace. Folders should be named concisely and fittingly. Which of the following is the clearer alternative? You may provide different users with different types of rights to your folders. You may provide specific groups with their own folders that cannot be accessed by other groups. Access to folders is determined with access control (see ‘Managing material’). You can also simultaneously create folders for each workspace member or group (see further instructions). 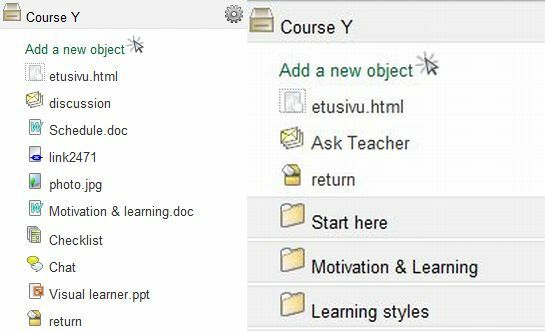 You can also link a folder with the folders of a specific group in which case all changes to the contents of the linked folder automatically appear in the group’s folders.